(R.R.P £279.99). 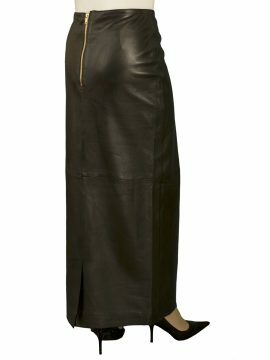 Beautiful quality – a mid-calf length black leather midi skirt in a sleek figure-hugging style. Tailored in luxury soft lambskin nappa leather, sourced exclusively from British hides. It features a chunky full length silver metal zip at the front- this opens fully, fastening from the top downwards. And why not leave it open a little from the bottom to show a little more leg and the beautiful red satin lining when sitting or walking? It is tailored to be close-fitting to emphasise the natural curvature of the body. Perfect for smart or smart-casual wear, great for vintage outfits. Length (from waist to hem): 31in-32in/79-82cm, depending on the size. Made specially for the Tout Ensemble label by Ashwood to our own design. NOTE: This same style is also available in other lengths: Extra short mini (12in); Standard Mini (15in); Above-Knee (19in); Knee Length (23in); Below Knee Midi 27in; Maxi (36in). A black leather midi pencil skirt with a full front zip, made in luxury soft lambskin nappa leather, sourced exclusively from British hides. It is tailored to sit at the waist and to be close-fitting to hug your curves in a sleek pencil skirt style. 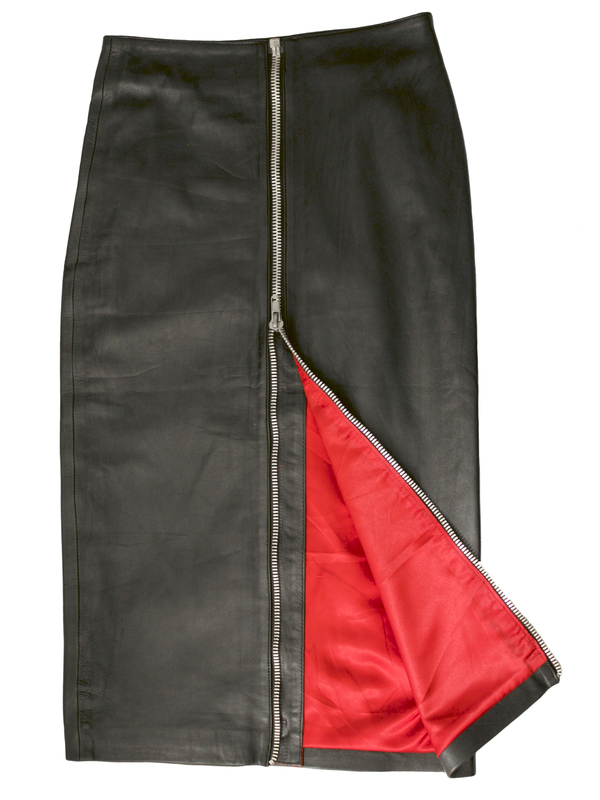 It features a chunky full length silver metal zip at the front which opens fully, fastening from the top downwards – to wear, you wrap the skirt around you and then close the zip. If you leave the zip open a little way from the bottom, it allows you to move more easily as well as showing off your legs and the red satin lining as you walk or sit.